Product #3584 | SKU AJA00156 | 0.0 (no ratings yet) Thanks for your rating! FiDO is a family of SDI/Optical Fiber converters. 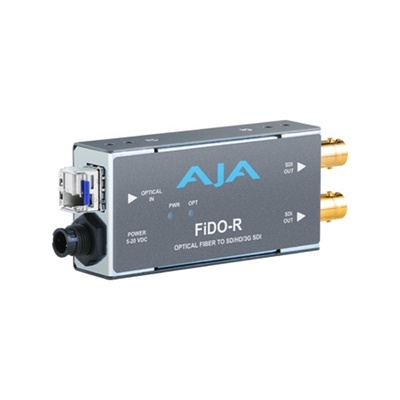 FiDO allows the transport of SDI, HD-SDI, and 3G SDI over distances up to 10km using standard single-mode fiber optic cable with LC connectors. FiDO converters meet all relevant SMPTE specifications and are rugged, versatile, and suitable for indoor or outdoor use. With 5 models, FiDO offers unmatched flexibility and cost efficiency. FiDO dual channel models allow the conversion of 2 channels—perfect for 3D, dual-link SDI, or 2 completely independent SDI channels (for example, SD, HD, and 3G can be mixed in any combination). Also, FiDO converters offer electrical isolation useful for eliminating ground loop problems.